L: 74" x W: 54" x H: 8"
Bellanest Royal Medium Memory Foam Full Mattress You're in for the royal treatment with this Bellanest Royal medium memory foam full mattress. Its thick high-density polyurethane core delivers comfortable support, while the breathable memory foam layer contours to your body to relieve pressure points and deliver a great night's sleep. You're in for the royal treatment with this Bellanest Royal medium memory foam full mattress. Its thick high-density polyurethane core delivers comfortable support, while the breathable memory foam layer contours to your body to relieve pressure points and deliver a great night's sleep. We purchased this mattress for my 13-year old son's new bed. It is firm but very comfortable. He loves it. It is also easy to make the bed with, not too heavy or cumbersome to move around. 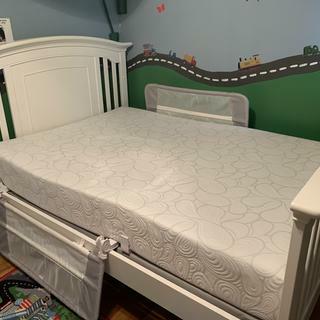 We purchased this mattress to go along with a storage platform bed. What a great purchase!! My 14 yr old son loves his new bed. It is well made and he says it is not hot when he is sleeping. Nicely made with no flaws, such as bunching or sinking. Great quality. Very happy with the quality for the price. Similar to Tempurpedic but was a good choice for my 10 yr old. I am very happy with the mattress, with the women who took care of us at the store. They delivered the next day. The delivery guys were in & out within 15 minutes & that included taking out the old box spring & mattress. Great service from beginning to end. This is the 2nd time shopping at this store. Love doing business with them. I must say I have never slept so good, get up in the morning feeling great love the price for my memory foam mattress, and can"t forget to mention my wonderful pillow, Love my Bellanest, I have recommended it to my family and my mom. Thank You Nancy. I love it.I can't get over it. I can sleep all day. Cant say enough about this pick. We purchased a queen size for my daughters bed back in August. What got our eye at first was the price but when we tried it out in the store we loved it. So incredible comfortable at such a great price. We needed a new mattress when she moved out and knew exactly which one to pick. This time we needed a full size. The good and bad of it... You look forward to bedtime each night... the bad. its hard to leave it in the morning. We have on in our guest bedroom as well now and plan on switching two more beds over to it in the next 6 months. My suggestion ... try it, you'll love it. First time trying memory foam!! Very comfortable mattress!!! Fast delivery and great price!! I purchased the bellanest memory foam mattress set for a guest bedroom. I tried it out in the showroom and was surprised how comfortable it was compared to my own more expensive named brand memory foam set. At the price point, I wasn’t expecting it to feel so good. I slept on it for a night just to check it out, and it is just as comfortable as my casper set for alot less money. Love it, great mattress helps u fall right to sleep . I know the salesman,Sam, told me to try this for 30 nights. No need. My first night on the mattress was the best I’ve had in a long time. Thank you! I would recommend it to anyone. Mattress is super comfortable. Bought this for my daughter. When asking her what kind of new mattress she would want, she said she wanted one just like mine. I have 2 other matresses in two different rooms, one much more expensive, one a little less expensive. Her choice for comfort was this one. I have had mine for almost 3 years, rotate every 6 months or so, and it's still like new. Super comfy and supportive, even for a toddler! This bed is so comfy! This is my son’s first big boy bed and he loves playing on it and sleeps so well on it too! 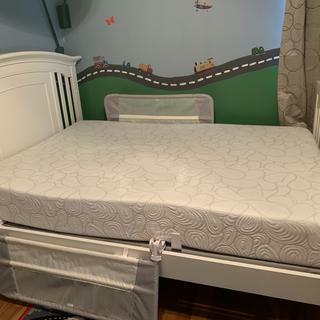 It is super comfy and was an easy adjustment from his crib mattress that had a memory foam topper. I love laying on it too and can easy fall asleep on it! This bed is very comfortable enabling me to fall asleep easily. It is big enough so that I can move around and spread out in different positions. The bed also has drawers on both sides which provides an excellent amount of storage! It also fits well and looks great in my room! I recommend this bed to anyone looking for comfort, good storage and great style. Purchased this mattress 2 weeks ago. I needed a mattress to help reduce my back pain during sleep. I consider this mattress pretty decent in terms of cost and comfort. I might need more time to fully evaluate this bed. I have another Serta & Sealy mattress which are not memory foam. I feel them little bit better than this mattress. I would like to see in next 2 weeks if this mattress helps me alleviate my pain & have a sound sleep. For people on budget this might be a good mattress. If I retain this mattress I might be curious to see if it reduces in height over time. Hi Linda, if you added on the Platinum Protection Plan for your mattress and are not completely satisfied after 30 days, you have the option to reselect a mattress with the assistance of a store or showroom manager. Keep in mind that it may take a few weeks for you to break in your new mattress. So allowing the 30 days, gives you a good indication of how your mattress should feel long term. Should you have additional concerns or need immediate assistance, please feel free to reach out to rfcare@raymourflanigan.com with your order details and we will address your concerns. BEST ANSWER: With purchase of a new mattress, Raymour & Flanigan will remove your old mattress. does this item come with tv offer? BEST ANSWER: For assistance with promotions and sales, please contact Online Sales at 866-383-4484, option 3.